Written specifically for military men and women and their loved ones, this book explains God's covenant of hope using stories that demonstrate God's protection of soldiers in times of danger. 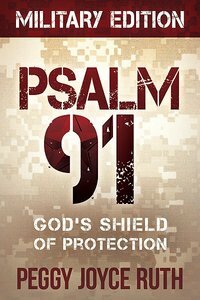 In "Psalm 91""Military Edition, "Peggy Joyce Ruth, a veteran Bible teacher, guides you through a personal study of this psalm, explaining verse by verse God's promises of protection, especially from a military viewpoint. The book will give military men and women--and those who love them--refuge and hope in this covenant promise from God. This psalm describes a haven of physical protection, safety, and security that can be found by trusting God's covenant promises when faced with life-threatening danger and fear, whether during a military mission or from a spiritual attack from Satan and his demons. Protecting our country is a dangerous job. But there is a place in God-a secret place-for those who want refuge. Written specifically for military men and women and their loved ones,Psalm 91 Military Editionexplains God's covenant of refuge and hope using stories and testimonies that demonstrate His protection of soldiers. About "Psalm 91 (Military Edition)"
Peggy Joyce Ruth and her husband, Jack, former pastor at Living Word Church, has taught the Wednesday night adult Bible study each week at the church for the past thirty years and continues to teach a weekly radio Bible study called Better Living on KPSM 99.3 FM. She also holds various seminars and conferences at different churches and organizations throughout the South.